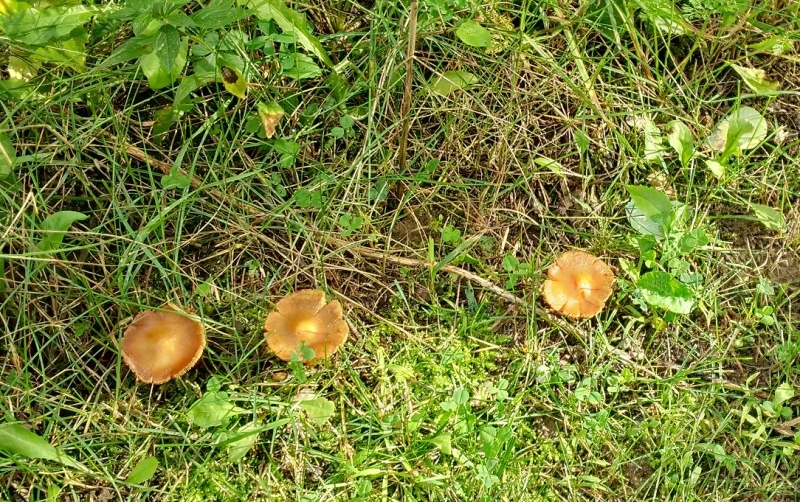 This unassuming little mushroom (Laccaria bicolor - the Bicolor Deceiver) pops up briefly in the fall. Its appearance means that the nearby Aspen trees have changed their mycorrhizal partners. We were out walking our dogs in a local wetland park near our home on the weekend when I noticed these little guys at the edge of a clearing. This section of the park was once cropland, and over the last 25 years or so, it's being slowly reclaimed by an adjacent wooded area. 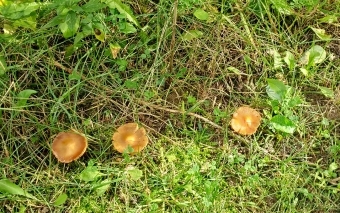 Laccaria bicolor are an ectomycorrhizal partner of a number of hardwood deciduous trees and conifers, and these mushroom caps appear briefly in the fall as part of their reproductive cycle. In this case, the nearby host trees are a combination of Aspen (Poplar) and Birch trees. Poplar is a very interesting species because as young saplings they are endomycorrhizal plants - and will form a symbiotic partnerships with the AM fungi associated with the roots of (perhaps) the grasses in the former farm field. This may be part of the reason why Poplars are a pioneering species in the plant succession process that will ultimately see this grassy meadow turn into a forest one day. Seeing these Laccaria bicolor mushrooms means that these Aspens have matured to the point where they have become ectomycorrhizal. First the Poplars will appear among the grasses in the abandoned field, and years later when the Poplars mature, the ectomycorrhizal trees will begin to appear. Birch (perhaps with their frequent partners Beech), and ultimately conifers like Pine, Spruce, Larch and Fir may follow the lead of the Poplar pioneers. And so, below the grade the mycorrhizal community helps this abandoned farmland return to a woodland. And Yes - Laccaria bicolor (and 8 other ectomycorrhizal species) are included in the Root Rescue Transplanter MS-CS formulation.